Why the removal of a passenger is such a big deal—and a sign of our times. This is exactly how I felt after watching that United Airlines video. Fights over armrest territory, special devices to block the person in front of you from reclining, and in-flight freak-outs have become all-too-common phenomena—we have come to view air travel as the place where decency ends. And then it actually ended. With a scream! I have watched the clip again and again, in utter disbelief at the surreal scene: a United Airlines passenger dragged from his seat and pulled off an overbooked plane by Chicago police officers using brute force to make space for four United staff (!) members. Some people in nearby seats documented the event with their phones, and the videos went viral to immediate outcry. The reason we are so appalled by United going nuclear is that it happened in one equalizing space that so many of us share: the airplane seat. It could have happened to any of us. And it was so shocking not because it violated a law, but because it violated something more sacred: our social contract, an implicit understanding of how we should treat and respect each other, discretely establishing invisible boundaries never to be crossed for the sake of efficiency and operational excellence, or other laws of the marketplace. Even louder than the passenger’s scream was the message United sent with its perplexing matter-of-fact series of responses, which implied that this behavior is somehow standard procedure. It is exactly this business-as-usual attitude that makes United’s initial actions and response to the subsequent outcry so unacceptable and yet emblematic of a broader cultural shift in America: clearly, everything, really anything, can now be sacrificed for business performance. Even worse, it is now seemingly legitimate to exhibit behavior like that not just behind the backs of the public, but in plain sight of a captive audience. The United staff and the police had no sense of wrongdoing: like robots, they were following orders, lacking any moment of critical thinking, and simply acting in accordance with the program, the operating system. Whenever this happens, our very civility—in fact, our very civilization—is at stake. It doesn’t just mean air travel is broken, it means our society is broken. Whenever the abstract system becomes more important than concrete individual well-being, whenever there is no more room left for discretionary action based on empathy and human judgment, for deviating from the standard “process,” then our humanity is at stake. When nothing is sacred anymore, everything is fair game. This is the tragedy of an America that is the product of a corporate America in which consumer-facing brands have become completely tone-deaf (case in the point, the recent Pepsi commercial featuring Kendall Jenner which has been widely criticized for co-opting and trivializing recent social movements) or even become bullies. From United to Uber, from old to new economy, recent scandals reveal a winner-take-all business world that justifies all means as long as you’re “winning.” No wonder trust in business leaders is at the lowest level since the 2008 financial crisis, according to the 2016 Edelman Trust Barometer. Rare are leaders like the late Mary Anderson, one of the co-founders of REI, the matriarch of one of the most beloved companies in America: a “corporation with soul,” as the New York Times called it. REI has managed to reconcile business success with a strong sense of corporate citizenship, and it has long been “doing well by doing good,” in the mantra of the CSR (Corporate Social Responsibility) declarations of so many companies. It is true that there are strong economic arguments for “values-based business.” When everything else is leveled in a globalized and transparent marketplace, the behavior of a company makes all the difference. Specifically, in the current political climate brands can no longer be fence-sitters: they must take a stance and let their actions speak louder than their ads. However, while the business benefits of values-based behavior are well-documented (millennials, in particular, are known to buy based on values and prefer brands with aligned values over others), there is more at stake. “It’s business, not personal,” is a line that we hear all too often, and it is one that ignores that business is always deeply personal, whether we like it or not. Business has the power to infringe on the essence of our humanity, as we’ve seen in the United video, and, on the more positive flip side, it has the power to enable and cultivate it, as REI and other “corporations with soul” have demonstrated. To meet this tremendous responsibility, companies must attend to their souls from the very start. The soul is often shaped in the initial stages, the foundational days and foundational stories. Founders must embrace a model that is more of a “deep start-up” than a “lean start-up;” one that invests in conviction, culture, and character early on. For once the business model is established and the operational engine is up and running, it becomes exponentially harder to course-correct. Deep start-ups operate at the magical intersection of what feels good and is the right thing to do. They invest in an idea of work and collaboration that views the well-being of employees, customers, and society as not just the most valuable, but the most precious good. How do we teach business leaders soul? This is not necessarily what we are prepared for when we enter the workforce. A new book, The Golden Passport by Duff McDonald (full disclosure: we share the same publisher), lays the blame for hardened behavior and moral failure squarely at the feet of MBA programs (Harvard being the most prominent punching bag), and not without reason: looking at the case study-dominated curricula of most business schools, how are business leaders supposed to create soulful corporations if they are not taught anything about the soul? How can they develop a sense of empathy and compassion, if human feelings are reduced to “emotional intelligence” and acquiring it is merely sold as instrumental to business success but not as a prerequisite for relating to others? It is no surprise then that you end up with companies like United or Uber that think of themselves as transportation businesses when in fact they should be in the hospitality business. And it is only logical that their ethos is fixated on punctuality and convenience, but misses out on the most fundamental virtue of all: decency. It should have served as a warning sign that one of United’s recent PR disasters took place when a young passenger was prevented from traveling because she was wearing leggings, or, previously, when it was caught “destroying guitars.” Those willing to accept collateral damage are usually the ones doing the most harm. In an industry that is so often associated with ugliness, every small gesture can be a milestone toward becoming a more beautiful business. It is not so hard to be loved. 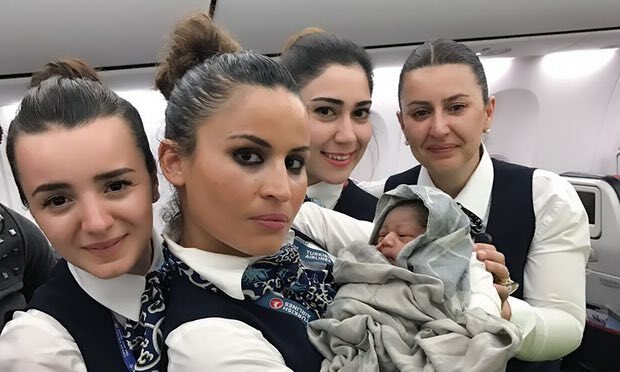 Turkish Airlines showed us how, by bringing a much needed respite of humanity back to the industry. While Americans decried their not-so-friendly skies, a premature baby was born during a flight en route from Guinea to Burkina Faso with the help of the crew aboard. No viral videos this time, just joyful photographs of the newest passenger. This post first appeared on Psychology Today.